Residents at a Shropshire care home will be able to take advantage of a new sensory room – thanks to the hard work and dedication of one employee. Hannah Oliver, 27, a support worker at Merrington Grange, near Bomere Heath, Shrewsbury, climbed to the Mount Everest base camp to raise more than £1,200 to help fund the new room. She was helped in her quest by builder Mark Cartwright, whose son Joe, 24, lives at the residential home, run by Shrewsbury-based Adelphi Care Services. He volunteered his time to install the sensory room and also helped with the fundraising by enlisting the support of the Shrewsbury Severnside Lions Scooter Club, where he is a committee member. Back in 2010, the club donated £2,000, raised from its annual fun day, to support the sensory room. Miss Oliver said it has taken a long time to get the sensory room ready but it was something she was determined to do for the residents. Her mother, who also works in the care field, had previously set up a sensory room, which inspired Miss Oliver to do the same. “She explained all the benefits so I started looking into it. The different equipment can be very stimulating for people with autism and learning difficulties and can aid fine and gross motor skills through different sensory experiences. “I designed the room using a ‘client centered’ approach, which meant taking into consideration each resident’s preferences, likes, dislikes and needs,” she said. Miss Oliver said creating the room was a “huge project”. “It’s an amazing feeling that it’s finished. Some residents suffer from anxiety and can be frightened about unfamiliar situations so along the way, I have introduced and involved each person by their participation in painting seating areas and the walls. 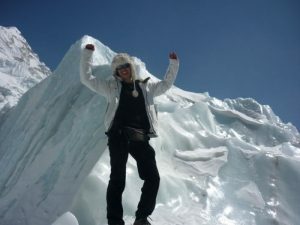 Hannah Oliver, who works at Merrington Grange, climbing Everest. Miss Oliver said climbing to Mt. Everest base camp was an “amazing and tough” experience. Miss Oliver said she had a lot of support from friends and family to complete the project. “I just want to say a big thank you to everyone who has helped,” she said. Mr Cartwright, who works for SJ Roberts Construction, a sponsor of the scooter club’s fun day, said he worked on the room in his spare time at weekends. “I wanted to do it for all the residents. Previously they had to go off-site to use a sensory room and now they have one on site they can use without the upheaval of transportation,” he said. Mr Cartwright said he was looking forward to his son trying out the room. Joe Kwaterski, business development director at Adelphi Care Services, said an open day would be held for the new sensory room in the near future. 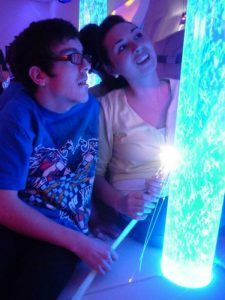 “We are very proud of the work Hannah has put in to create the sensory room. “It will bring so many benefits to our residents, whether as a place to relax and listen to music or to use some of the equipment. “It is a much needed facility and something that our residents will really enjoy,” he said. To find out more about Adelphi Care Services visit www.adelphicareservices.co.uk, call (01743) 465299 or e-mail admin@adelphicareservices.co.uk. Be the first to comment on "Sensory room opens at Shrewsbury care home"